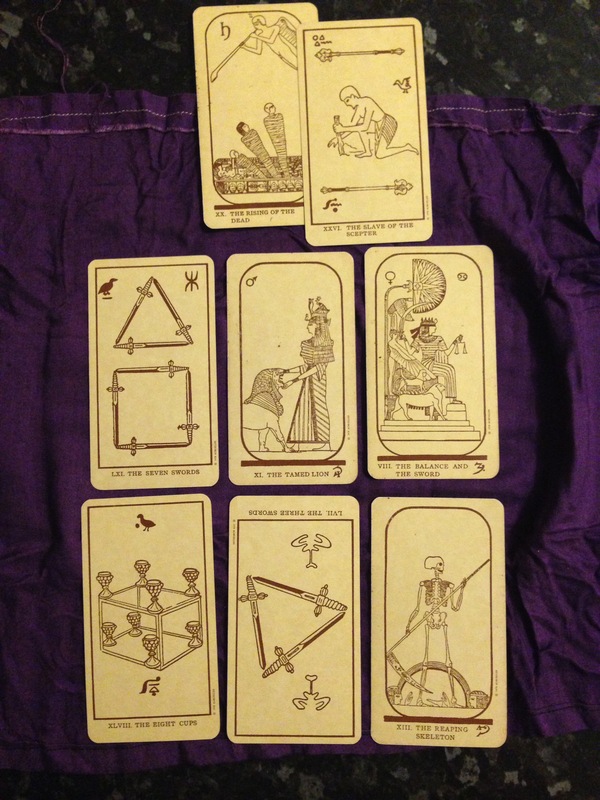 Katalin Patnaik – Page 2 – This site is for jotting down whatever is in my mind about tarot and its connection to life in general. I have meant to write this post since the beginning of the project, but alas, something was always more urgent. But, you have time for what you make time for. And as we know time goes by so quickly you don’t even realise! On the 7th November (25 October in the Julian calendar Russia used that time) 1917 a signal was sent from the ship Aurora, that would change world history forever. On that day, monarchy ended in Russia and gave its place to Lenin and the Bolshevik. To commemorate this event Silhouette Publishing has came up with the idea of creating a not for profit, collaborative deck. Natalia Plakhina, Vladimir Sitnikov and Elena Udina have successfully herded their cats, and voila, the deck is in its final stages of creation and available to preorder! Big shots who gave their name and artwork for the project include Ciro Marchetti, Robert Place, Alexander Daniloff, Oswaldo Menegazzi, just to name a few. And among the smaller contributors you can find, well, me. 🙂 Here I would like to thank all the gods for TABI, social media and Ciro Marchetti’s choice of card! Ciro, thank you for choosing Rasputin! If it wasn’t for that post you wrote in TABI’s FB group, I would never have found this project! And now, I’d like to show you my cards. These are the images I have sent in. They don’t have a border yet, they aren’t the finished product. But I am so very proud of them, I just can’t express it in words, haha! So much for trying to look modest. 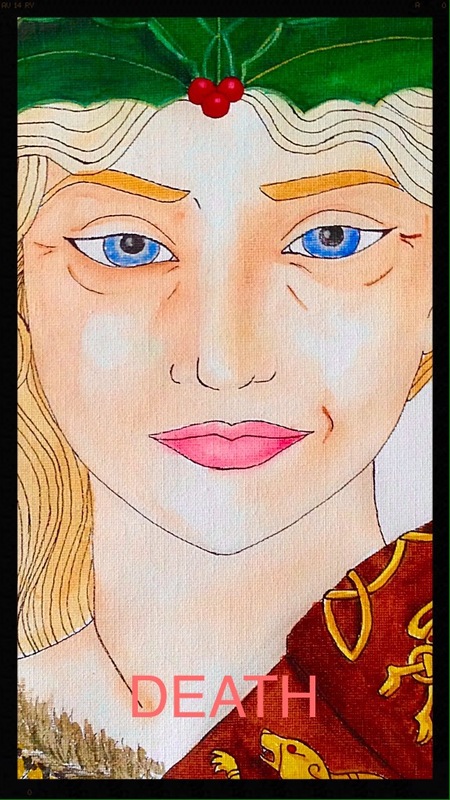 Here I present my submissions for the 1917 Tarot! The Six of Hammer and Sickle (Wands). Gagarin’s space flight was just 21 days before America’s Alan Shepherd’s!! He does look vexed, but then America beat Russia to the Moon. 1-1! 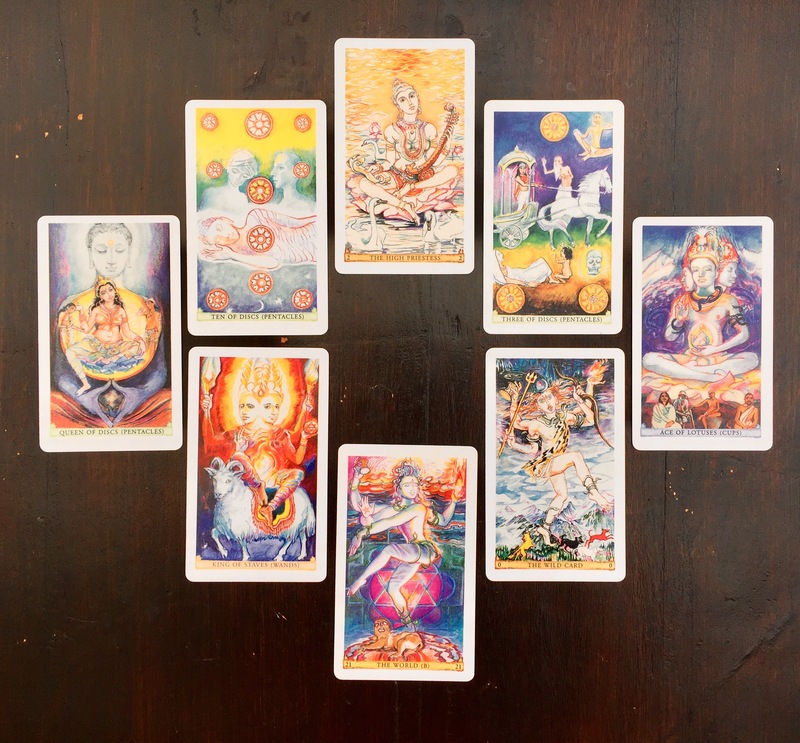 Our wrangler Morgan Drake Eckstein has asked us to write about how we show respect to the tarot and any other divination system we might use. At first, I had no idea what to write. I don&apos;t have any elaborate rituals, I say no prayers, light no candles or incense sticks before reading… I was worried my post would consist of one line: "I wash my hands and wipe the table clean before starting to shuffle." Not a very interesting hop. Then I made myself think harder and ended up looking like Winnie the Pooh; bent over with effort, scratching my head. Still I had only a vague idea of the basic stuff everyone does (I think). I don&apos;t ask the same question over and over unless something changes in my (or querent&apos;s) circumstances. I read whatever cards came out and put extra effort in if they don&apos;t make sense at first glance. I don&apos;t like people touching my cards except when cutting the deck – a habit I got from my grandparents while playing Rummy. But these are common enough. Nothing extra there. So what the heck do I do to show respect to the cards? Even after falling over like a sack of potatoes (remember I was in the Pooh position), I couldn&apos;t think of anything special. And then, after resigning to hopelessness and almost withdrawing from the hop, it dawned on me. I&apos;ll ask the cards! Out comes the wonderful Egyptian Tarot from its 15 year old cotton wrap that I sewn for it when its box fell apart! It looks as if a five year old has done the sewing but they have lived in it forever and it has a sentimental value for both of us – i.e. the deck and me. Me: Hi guys, nice to see you again! Me: Oh don&apos;t be such Ten of Swords, you know you are my favourites! Me, shuffling: So I have this blog hop I want to do but I have no idea how I show respect to you guys and my other decks… help? 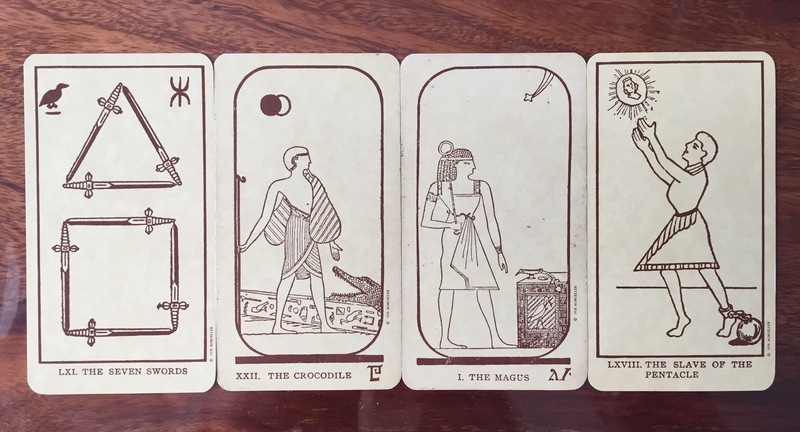 ET – Out jump the Seven Swords, The Crocodile (Fool), The Magus, and the Slave of the Pentacle (Page): When the need is great you come to us with an open mind, believe in our magic and put it to use, and strive to learn. Me: Awww… 🙂 But that&apos;s what anyone would do. Don&apos;t you need a ritual or some candles or stuff…? I&apos;m starting to feel bad about not having any special measures for you guys. Me: But how do I love you? I only come to you when I need advice. I don&apos;t do daily draws or journals or journeys. I just… come when I need you. 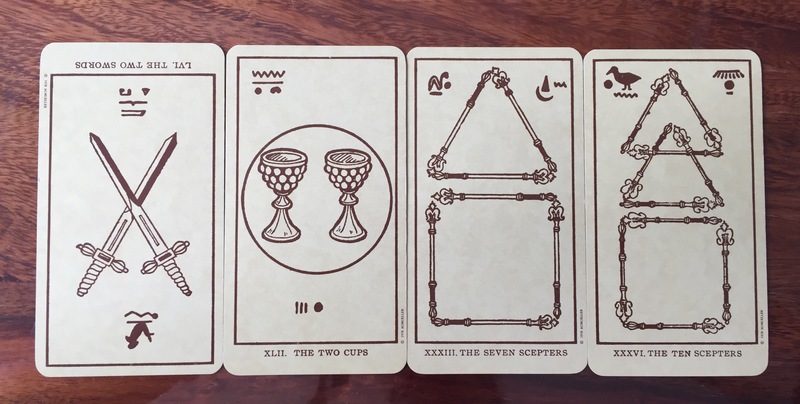 ET – out jump the Two Swords face down, The Two Cups, the Seven Scepters and the Ten Scepters: You don&apos;t fight with us, you work with us in peace and after taking our ideas on board you see them through to success. 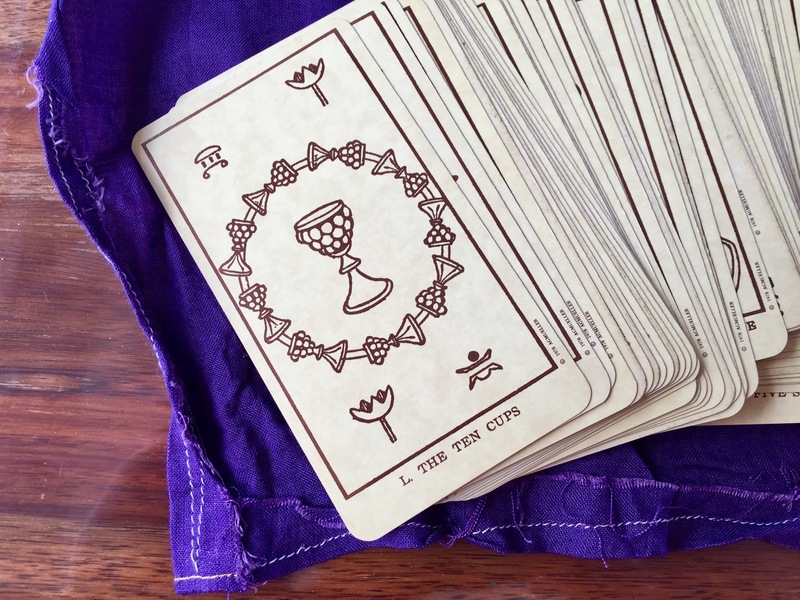 ET – out jump the Twilight (Moon), The Crown of the Magi (World), the Two Ways (Lovers) and the Four Cups: Don&apos;t let others influence you with their own beliefs. We feel good in our lame wrap, it is part of us now. We love it this way and feel safe and loved. DO NOT DARE TO TOUCH US YOU FREAK OR WE WILL NEVER ANSWER A QUESTION EVER AGAIN! *I need to share the description of these cards, to show the gravity of the deck&apos;s words (and for those who read RWS and may not understand the reason for the red colour and the caps lock): Seven Swords: sudden catastrophe that may affect the brain; a loss of position; ultimate triumph. 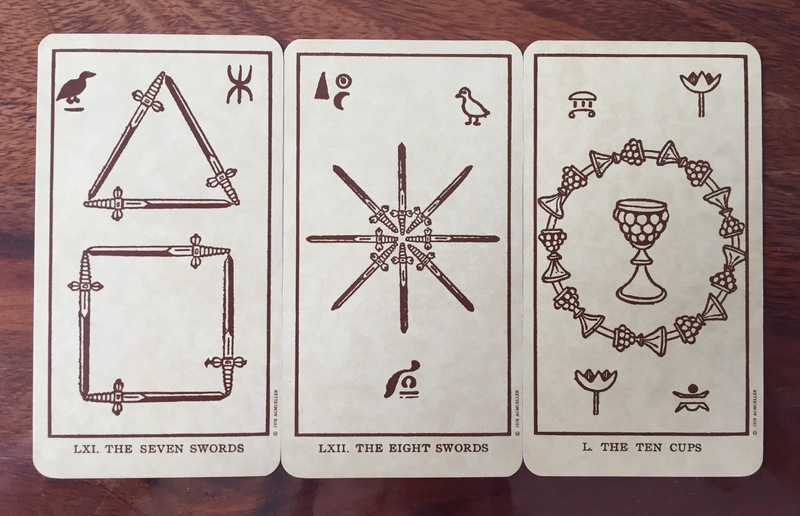 Eight Swords: you are threatened with the loss of a law suit; that great anxieties are in store for you, you may even be sentenced to a heavy penalty, prison or death. 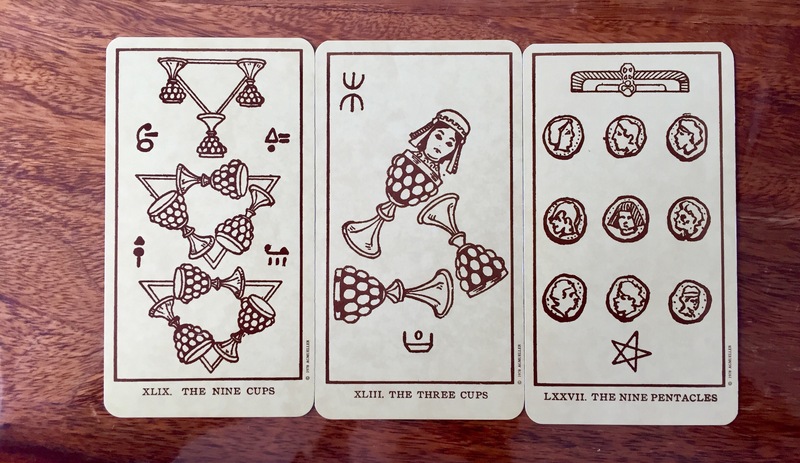 The Ten of Cups is the sudden change of tone, and has the nice and cozy meaning similar to the RWS. And so the reading ended, the wonderful Egyptian Tarot has gone back to its lame wrap, and I have learned that the important thing is not the ritual, the candles and the looks, but the love and respect you show your cards in your heart. Follow their advice and they will guide you through the maze of life. I have been searching the internet for a spread on this topic for ages, but couldn’t really find what I was looking for. This is a spread I have made to look at past lives in a constructive way. What is the point of knowing who you were if you don’t learn anything, right? Now, this won’t give you your past name, but it will address some issues you might be facing in this lifetime. 4: Useful traits you brought into this life? 7: What karmic debt can you balance now that was made in that life? – e.g. 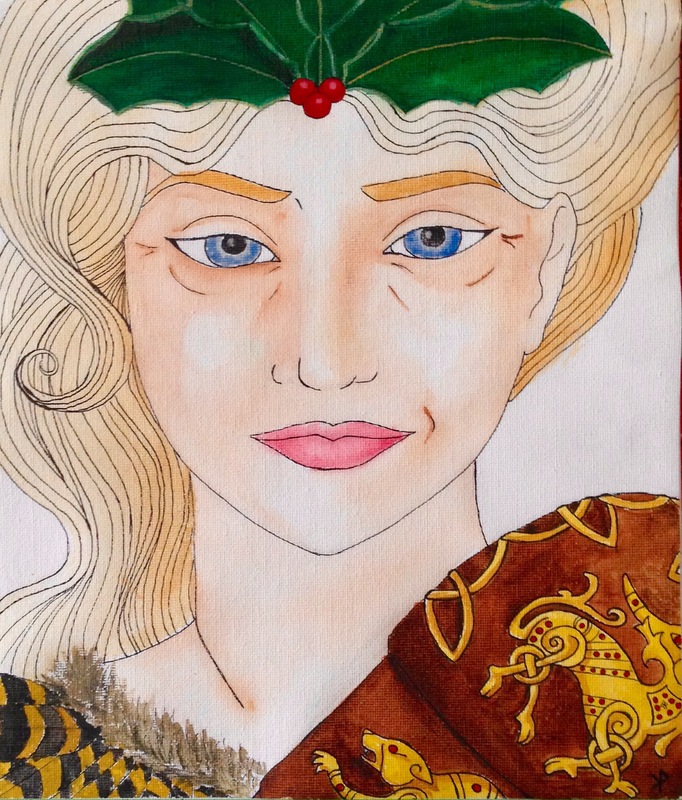 If you were Emperor Nero then, you have quite a lot on your plate but most of us will have a lot less. 8: How can you restore the balance? On the card we see Devi Sarasvati, the goddess of Knowledge and Arts. A scolarly life, quite lonely either because I have decided to be a nun or an ascetic, or because even if I had family around me I was living in my head. A life spent with studies. I was probably very proud of my knowledge too. On the card we see Prince Siddhartha riding out from his palace, and being confronted with sickness, old age and death. He is deeply shaken and decides to start his journey to become Buddha shortly after this experience. The card shows Lord Shiva in a meditative state as the source of spiritualism. 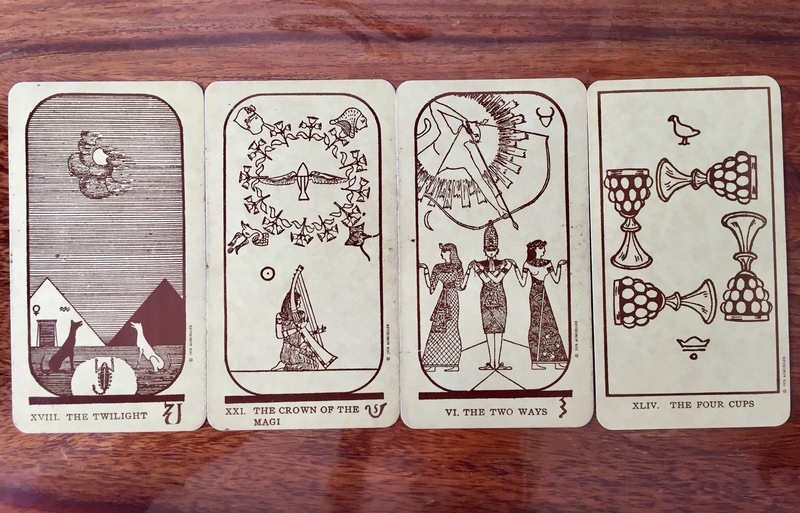 The suit of Cups shows his evolution from an ascetic to a family person. The card shows Lord Shiva’s Rudra avatar. Rudra (the Screamer) has jumped forth from Lord Brahma’s forehead and started breaking the half-made universe because he didn’t have a name or a purpose. When Brahma gave him the name Rudra and told him to do some creation, he calmed down and finished the universe. Yipee! A useful trait I brought from that life is a faith in… faith. Whatever has to happen, will. Whatever had to happen, has happened. No use of being a five of cups and cry over spilled milk. Hakuna Matata. The Fool is always ready to start on a new adventure and has complete trust in himself that he can do it. Or if not, there will be something else he can do. But there is no way he will be stuck for more than a short time. The card shows Lord Shiva as Nataraj, the Lord of Dance – and the one who’s dance is the pulse of the universe. Creativity, self-worth, confidence, loudness… something terrible must have happened because I have almost none of these things. I know I could be like the KoW but somehow I am afraid to be. I am afraid that my work will be misunderstood, that I will have to explain myself, I have impostor-syndrome… I’ll do a separate reading on this matter later on. It’s a lot. In a nutshell: I am afraid to be ‘out there’. Being a mom. Spending time with family. Being a family person, and enjoying it. So, what have I learned? To sum it up: I need to realise that this is a new life with new experiences and opportunities to get rid of some karma. I have to let go of the block on my Wands aspects (I will do a detailed reading on this later on); I also have to embrace being a mother and not let society’s expectations spoil the fun. And I have to make myself aware that I actually can finish projects and I know how to carry things through… just have to get the hang of it again! Shuffle your cards in my name, and have a great day! Cards are from the Sacred India Tarot by Rohit Arya and Jane Adams. After my previous post I wanted to know what I would have thought about Rasputin, had I known him in his life. Out with the cards! In St Petersburgh I would have been openly attracted to him, lol. Probably mostly physically, although his magic would have been intriguing too! And if we talked now, I’d be digging for long buried answers for long dead questions. The whole time I have felt his presence behind me. It wasn’t manacing, it felt more like he was interested in what I was doing. Then I have asked him through the cards whether he would mind if I called him Grigorij. For a second the thought of him saying “yeah, call me Grishka” flashed through my mind. At that exact same second the Fool jumped out of the deck. I was laughing so hard! 😀 He must be thinking I’m total bonkers – I am, actually. No hard feelings. “I won’t bite” he said. “Self confidence, emotional and psychic stability. The ability to not give a damn about what others might think. Death, change, transformation, and how the other side works. 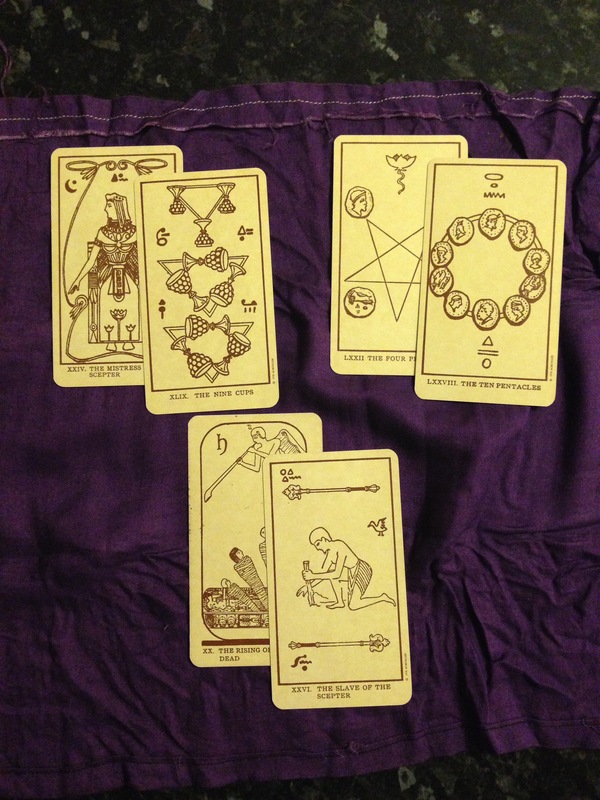 I could teach you how to handle ghosts.” – Eight of Cups, reversed Three of Swords, Death. Yes I know what you are thinking. This degree of daftness needs a special talent to manage. But I finally realised that if I can talk to him without soiling my pants, then why couldn’t I do the same with any other common ghost!